A bug in the game causes damage scaling to change after loading a save. A port to the Kex Engine by Night Dive Studios is in the works. Also includes the "Plasma Pak" and "Cryptic Passage" expansions. Pre-packaged with DOSBox. BuildGDX Reverse-engineered gameplay-accurate port written in Java. Adds high resolutions support, OpenGL renderer, improved mouse controls, and fixes for the original game bugs with an option to revert them. Can run official addon and custom made campaings straight from the main menu without the need to use installers or replace any original files. Has custom difficulty option that allows to choose different combinations of enemies count and damage dealing or receiving. 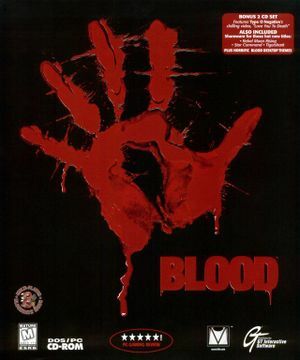 NBlood Reverse-engineered gameplay-accurate port of Blood based on EDuke32. Features original software renderer, improved OpenGL renderer, and OPL3 emulation. The One Unit Whole Blood Launcher is recommended for the best experience. 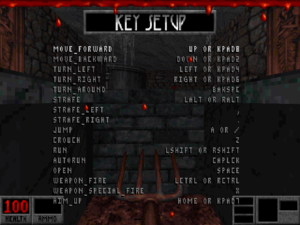 It includes a large number of optional modifications and custom maps. The Build Game DOSBox Launcher allows installation from both digital release and retail release. 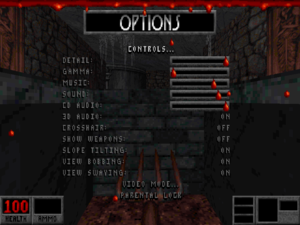 It also includes a large number of optional modifications and custom maps. Unzip bmouse.exe into the folder where you installed Blood. Run setup.exe through DOSBox and go to Controller Setup > Choose Controller Type and select "Keyboard and External". Go to Setup External and change the program name to BMOUSE.EXE, save and exit. Open dosboxBlood_single.conf in a text editor and replace the line containing BLOOD.EXE with bmouse.exe launch blood.exe. You can do the same for Cryptic Passage by opening dosboxBlood_Addon.conf and replacing CRYPTIC.EXE with bmouse.exe launch cryptic.exe. bMouse will cause the vertical aiming to be inverted. To fix this just go to the Setup Advanced Control Options from Control Setup, then at Advanced Mouse Setup change the Mouse Y Scale to negative number. 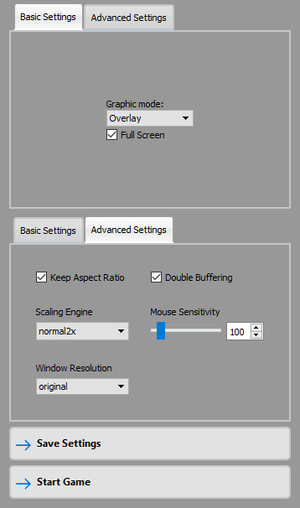 Buildmfx is a patch which improves mouse looking. 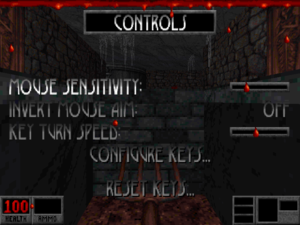 BloodCM is a Blood remake in the form of a mod for EDuke32, a Duke Nukem 3D source port that provides modern features such as widescreen resolutions and dynamic lighting. Use this script whenever you play Blood. A driver for the VFX1 headset can be found here. 1.0 Beta patches for 3Dfx support can be found here. Note these patches are largely unstable and never completed. 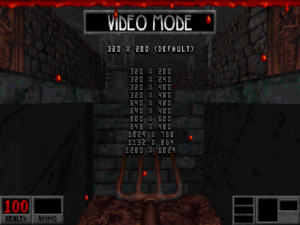 Default mode in DOSBox and only mode in classic version (without 3Dfx patch). Supports extremely high resolutions for a DOS game (over 1600x1200). ↑ 2.0 2.1 File/folder structure within this directory reflects the path(s) listed for Windows and/or Steam game data (use Wine regedit to access Windows registry paths). Games with Steam Cloud support may store data in ~/.steam/steam/userdata/<user-id>/299030/ in addition to or instead of this directory. The app ID (299030) may differ in some cases. Treat backslashes as forward slashes. See the glossary page for details. This page was last edited on 21 April 2019, at 17:40.